My boss Matt Donato (comical genius and fellow Marine) once suggested that chicken wings may be more addictive than alcohol, in that it’s impossible to ever sit down and eat just one. Personally every time I eat wings at least five chickens have to die, so I might go further and say that chicken wings are more addictive than alcohol, nicotine and heroine combined. Just look at this and tell me you don’t get the shakes. 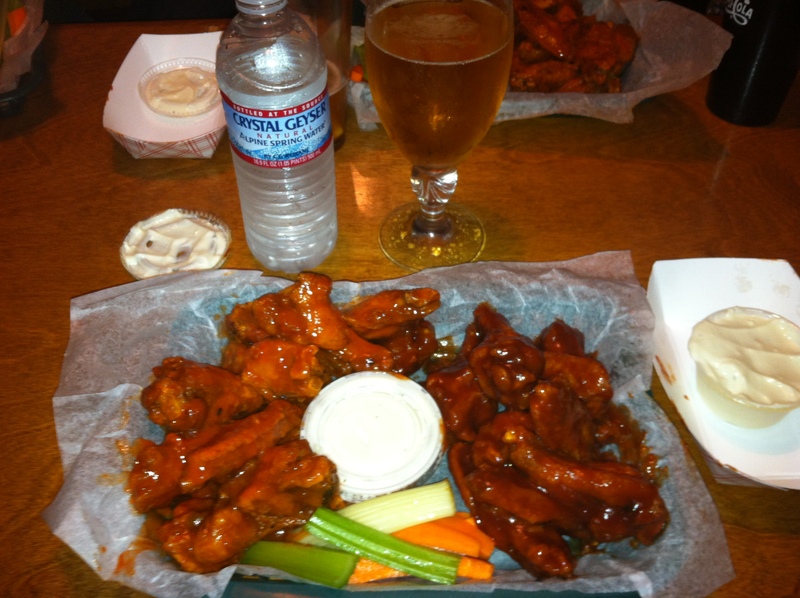 This beautiful basket of wings only cost $1.00 on Tuesday nights. That fine bottle of Crystal Geyser, however, costs $3.50. This is to prevent the vagabonds and ne’er-do-wells from coming in with 50 cents, ordering tap water and stinking up the place. It also keeps out the scallywags. I mean, if you’re short on funds and really need to get your wing fix you could probably go there with $5.00, have a soda, fill yourself on wings and leave a reasonable tip. You find me a better wing deal in Saratoga, I buy you 100 of them. No lie. Because it would cost me less than $5.00.